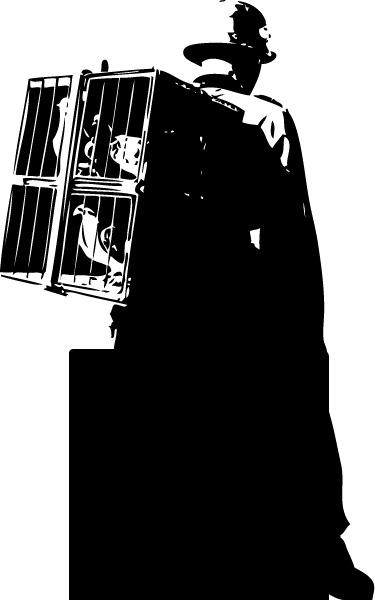 Hello, dear WordPress blog, I know I’ve been neglecting you lately, but, to be perfectly honest, I’ve been spending a lot of time with Tumblr. Yes, I know, everyone says she’s so easy, but she’s really great, honest, and always attracts such an interesting crowd. You’d like her too, I promise. Last week, an early morning electrical fire at Gilcrease Nature Sanctuary burned down the rehabilitation building, destroying the entire structure and killing over 200 parrots and other exotic birds. 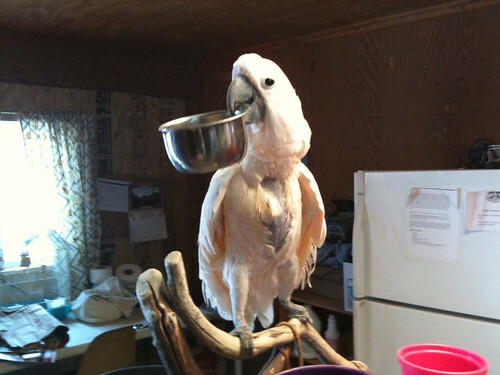 After the initial scramble to provide veterinary care and housing for the remaining birds, the frazzled team then had to handle the incoming donations (mostly cages and supplies) while caring for the hundreds of parrots still squawking away in the rest of the facility. A call for volunteers was made, and as I don’t start the new job (more on that later) until Tuesday, I spent the last couple days onsite. 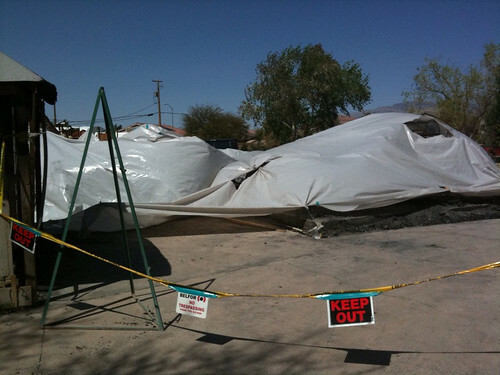 The rehab building, after the fire. 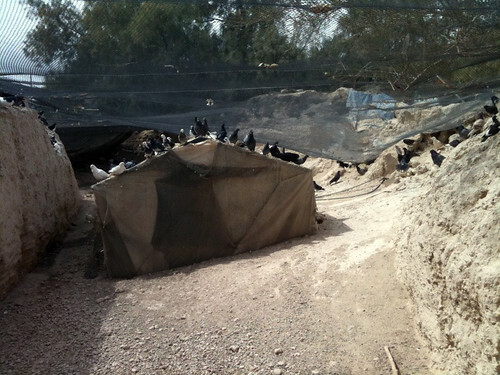 The tragedy is that many of the birds housed here were those with special needs, abusive pasts, and disabilities, birds that many of the staff had spent much of their time with to make their lives better. The team was crushed by the experience. 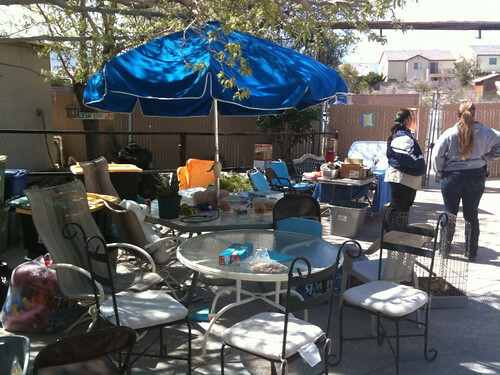 The donation and volunteer staging area. Members of the local community arrived throughout the day, delivering blankets, cages, and supplies. 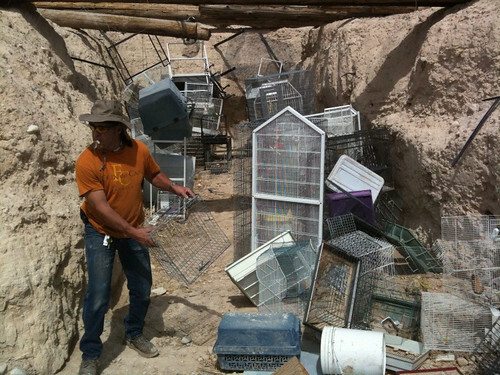 Joe, a frequent volunteer at Gilcrease, powerwashes donated cages. Once the cages were clean and ready to go, many became an immediate home, while the remainders were set aside for future inhabitants. 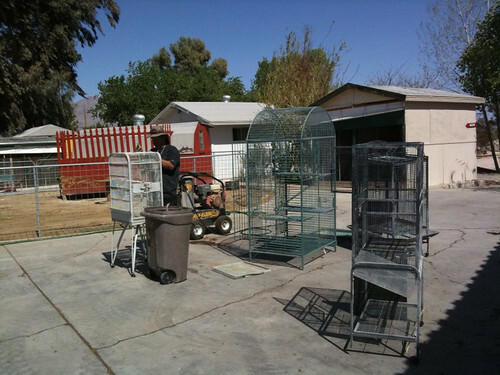 Over the years, many of the damaged cages were collected in the back of the lot. Harold (another volunteer) and I spent an afternoon organizing them, separating salvageable cages from those that were too far gone to use. Factoid: the Gilcrease land and surrounding area houses one of the largest known mammoth fossil sites, twice the density of the La Brea Tar Pits. This is my bowl! Aside from hauling cages (and gaining a swell farmer’s tan), I got to meet (and clean up after) a whole group of amazing parrots. You can’t have my bowl! 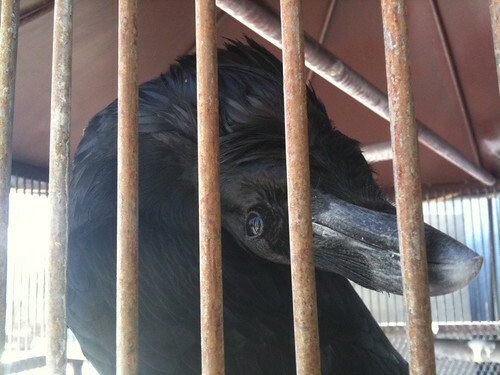 Jackie the raven, found and raised by a couple of construction workers and now living at the sanctuary, does that weird thing with her head again. 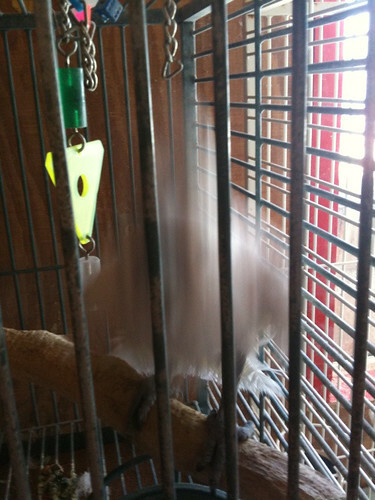 Babygirl wouldn’t sit still for her photo opportunity. It’s a trap! 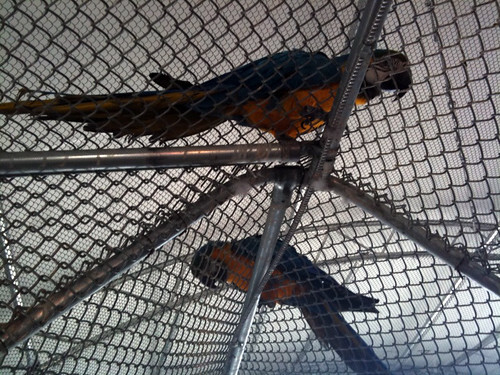 Macaws sit overhead in one of the flight aviaries. Tread carefully, here. 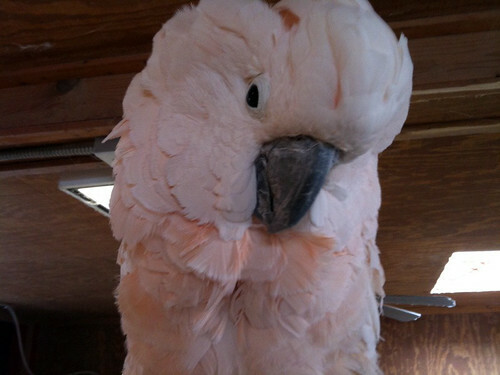 Another macaw eyes me warily (and I, her) as I clean her cage. 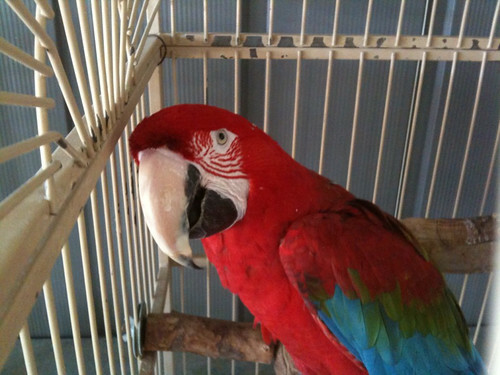 I’m accustomed to African Greys… Macaw beaks are huge. Cockatoos are like little babies. Cuddly, loud, maniacal little babies. As one of the staff stated, out of the fire rises the phoenix, and, using a recently acquired grant, Gilcrease plans to rebuild much of the facility, using modern materials and installing sprinkler systems in all the buildings. The sanctuary will reopen to the public with a planned remembrance ceremony and arts festival on April 24th and 25th, 9:30am – 5:00pm. Man I very sorry to hear that you lost 200 birds that is a shame. 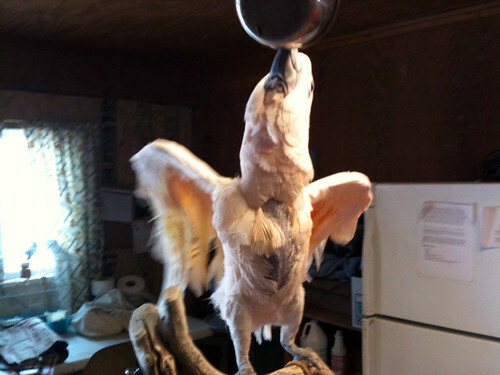 I myself love parrots and all animals I would feel terribble after something like that. Those poor birds. I had to put a calf down one time and have lost a few animals and it always take me months to get over it. Just lost a Sheperd of old age and she was my baby and it just killed me to this day. So I know how you feel. The flock will never be the same.